Personalized backpacks. Fashion forward and durable school backpack or travel bag. Trendy, irregular bloom pattern in stylish color combination of turquoise and white with fuchsia trim.. Matching accessory bag available for purchase search item WB-M715HBLOOM and duffle bag item WB-M300HBLOOM for a complete set. Outside front and size zip pocket, mesh water bottle holder and padded backpack straps. Embroidered personalization included with purchase. 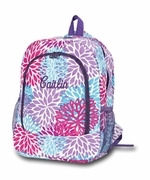 Personalized backpack measures 16"H x 12"W x 6" across bottom.